I thought it was about time to provide some updated links for DIYers to follow. If you think a simple loom limits you to simple weaving, then think again! You can do on a backstrap as much if not more than you can do on a 4 shaft loom, and its often much easier because you are not limited by the shaft system. She provides tutorials in both English and Spanish for the various pattern weaves of South America, and has also worked out, using those skills, how to do double weave, as is done on a multishaft loom. Its much easier! She has already published a monograph on Andean Pebble Weave, and there is another book in the wings - the links are all there on her blog. There are also links to the backstrap group on Ravelry which is about to start a Weave-a-Long in the New Year. Although written in German, Google Translate makes a good job of translating it and much of it is self-explanatory anyway. Some pages are in English, and Anneliese herself speaks and writes excellent English. and has written a book that is referred to on Laverne's blog. Many of the pieces Laverne has woven recently are base on photos from the book. and they are free to download. While her work was written for multi-shaft looms, she does give the patterns so they are very easy to follow on a backstrap loom using the techniques on Laverne's blog. which is provided as a resource for backstrap weavers. Its not so much an active group, as it provides links to other sites and events of interest to backstrappers. Its an alternative to the Mb hungry sites for those who are still on dial up or limited internet services and is monitored by myself, Laverne and Franco Rios who are ready to answer any questions you may have. You will find the link to 3 free workshops at the lower left of the home page. The first is run by Traci Bautista, on doodling, then Kathy Johnson, a wonderful watercolourist is running one on watercolour sketching and finally Mike Mattesi is running a workshop on his Force drawing techniques. See you there? NAYY, etc - I discovered them earlier this year and had great fun moving out of my confort zone! Is it really 4 years since my last entry? A lot has happened since those days, but Iamstill as passionate about my fibres as ever. I have updated the website and added extra pages , including projects for building a Toba Loom and how to make a Uzbek band using a 3 way warp. I have added to my spindle collection, some of which are on the new pages. I have also bought some more wheels <grin> and use the lot, and a few looms, a 4 shaft table loom that has been converted to a floor loom and could have been made just for me, and an Ashford Katie and Knitters Loom. More on those some other time. I still dye my yarns, sometimes with a bit more difficulty than others, particularly when it comes to banana silks, but the results are lovely, and I have explored colour splitting to get a tie-dyed effect with tops. My Ebay store has gone; their latest grab for cash was the last straw. I sell at craft fairs and am exploring Etsy and a couple of Aussie sites where sellers do not have to compete with Chinese mass-produced manufactured hand-crafted products that pour out of their factories and mills by the millions. I will also eventually list some of my items on this blog too. I have taken up sketching and drawing again, and have decided to enter the Sketchbook Project 2012, with the theme "in 50 years". Its an interesting experience! Enough for now, I have lots more to talk about, but I need to prepare for a craft fair tomorrow and have an early start. And I need to take some photos as well! Thank you for bearing with me and I hope to keep up with my entries a bit more regularly than in the past. Beaded yarns are cool, and once you have the technique, quite easy to make. Generally its thought there are 2 ways to make them: thread them on your yarn as you spin or thread them onto a keeper yarn and ply with it. Both have their advantages and disadvantages. Or, you can use a hand spindle. The Tibetan technique involves a double winding on. 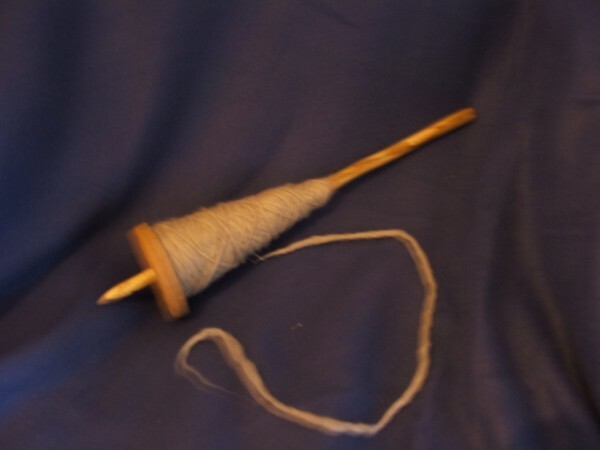 Firstly at the top, then re-wound a second time at the base of the spindle, which is ideal for spinning with beads. I prefer this technique as the heavy spindle allows for a longer spin leaving both hands free to manipulate your fibre and beads, while you can still spin a very fine thread. First select your beads: plastic are best, as they weigh less, but be careful of their finish - many cannot be washed. If you will be plying using a wheel, they have to be able to fit through the orifice and the hooks so they cannot be very large, or have odd shapes. If you can by-pass your orifice, have a quill wheel, or intend plying on a spindle, then you can experiment with larger and odd-shaped beads. You will also need a large eye beading needle ( it looks like 2 thin pieces of wire with the ends glued together), and your rovings or tops. Using the spindle in supported mode, spin as fine a yarn as you can, for about 1 metre. Using the large-eyed needle, threads beads onto your freshly spun yarn. If you are setting your beads about 10 cms/4 inches apart, you will need about 10 per metre, so for this one time, string 20, then start moving them gently down the yarn to where you want them. The extra will stay up at the top at the unspun end. Add some more tops/roving and start spinning agin, drawing up the beads with your spindle hand and spacing them as you go. When you have a couple of beads left, break your yarn, thread the end, and add more beads, before spinning the next metre. As you become familiar with the process, you can spin a longer length of yarn, and add more beads, so you need to stop less often. The spindle will fill quicker than usual so you will need to wind off, and even join several cops of yarn. When I ply my yarn, I make the plying yarn from the same tops that I have used to spin my beading thread. That way, should your yarn shrink, both plies will shrink at the same rate. I had finally got myself organized for this blog when - I lost my broadband connection very suddenly and it took weeks to get another connection up and running. My old ISP left "complex codes" on my phone line after I jumped ship to a cheaper telephone/internet provider, and it took forever to get them all lifted, one at a time, as there were even codes there for telephony services that I hadn't asked for, let alone knew about! . As an exercise, I dyed a KG of Merino fleece in a red/yellow colourway, similar to the one in my last entry. Despite scouring the fleece twice, there was still sufficient lanolin in the mix to keep the colours a bit muted and stop them taking properly (2 years growth of fleece more than equals 2 years worth of grease!!). I then took the palest fibres and split them into three lots. One I overdyed in red, one in orange and one in yellow. I started carding and spinning this up, trying to keep the resulting yarn as textured and feral as possible, preferably without actually adding anything to the yarn. 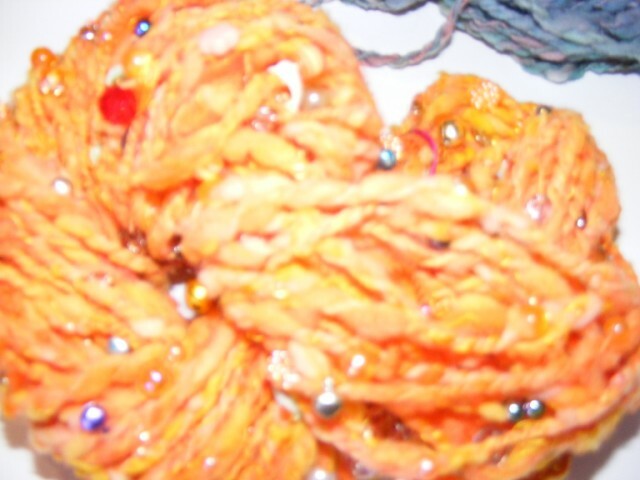 Some I mixed with shredded fabric and a few other yarns. and then I got a bit sick of the colour, so I overdyed everything blue. The result was three different and distinct set of colours ( for the three batches I zapped in the mocrowave). 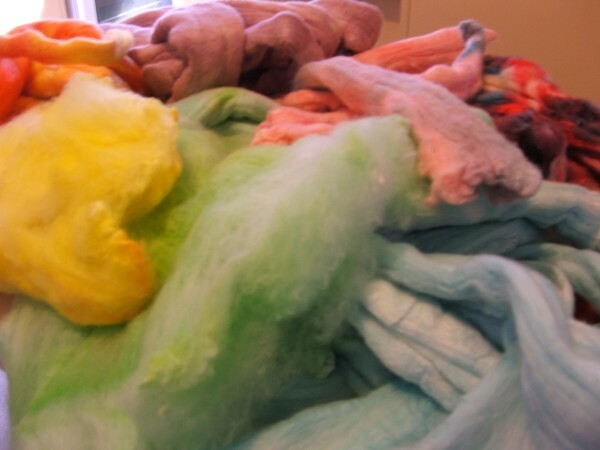 The blue/purple came from the fibres that had ben overdyed red previously, or had retained a pinky tinge. the greens came from the rest, and the colours varied from rich browns to blue/greens, and all had a mossy feel to them, which I have tried to reflect in the yarn itself. These all came from the standard food colours, using primary colours only, and not pre-mixing any particular shade before the dye went into the bath, except for the orange, and even that was 50/50 red/yellow. I also learned one thing: it is possible to significantly abuse Merino fleece without it felting! all these tops have been dyed using food dyes. I did these as a batch, soaking all the tops in a mixture of warm water, Morning Fresh dishwashing liquid and white vinegar for half an hour. I then squeezed the excess water out, put them in a dish ( I use ice-cream containers) and started playing with the dyes, generally mixing a small but strong mixture, adding a couple of capfulls of vinegar, just in case, and gently pouring the colour on, or applying using a dropper. That way I could mix and match as the nmood took me. Before zapping each batch, I gently prodded the tops to ensure that the colours spread and blended, and I could have done with being a bit more enthusuastic as some lots had a bit more white than I wanted. 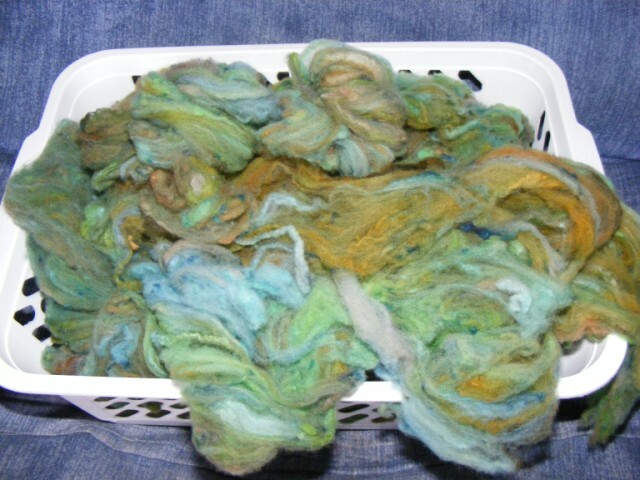 1 batch has already been spun. This is easily adapted to spinning sitting down and using a small bowl (or re-cycle your ashtrays, some are just the right shape!) to control the point of the shaft. It works better with a heavier whorl with its weight in the centre, not out at the edges and can get very fast. Its like charkha spinning without a charkha! I had a needle with a large eye that was small enough to go through # 11 seed beads, so I spun about 1 metre of thin yarn, threaded my yarn onto the needle and added the beads, then started spacing them. 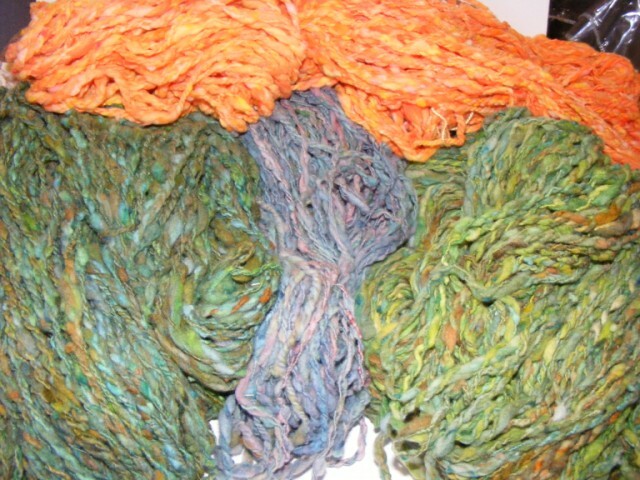 When I reached the end of the spun fibres, I re-attached the tops and spun some more. I found that if I added enough beads to keep sliding them up the yarn for a couple of metres as I spun it, my work went very quickly. I then spun a thick and thin yarn with neps and plyed the 2 singles together on my wheel - a bit tricky as the beads do get caught and can break the yarn, but I have slightly felted the yarn to help it hold together in use. Some of the beads I have used have been nearly 1 cm in diameter and I began wondering if I needed a bigger orifice on my wheel! With hind-sight, I know I couldn't have managed to spin this on my standard Saxony-style wheel - too much stopping and starting so it would be hard to get into a rhythm. It would have been difficult on the charkha for the same reason. But on the supported spindle it went quite quickly, taking 2 nights to spin the 2 plies I needed, including adding the beads. 2 years ago I would have said that using the spindle was probably a step backwards, but now I'm positive that we in the West haven't even started to explore the range of things that can easily and quickly be done on a spindle, and that would be near to impossible to do on a wheel. 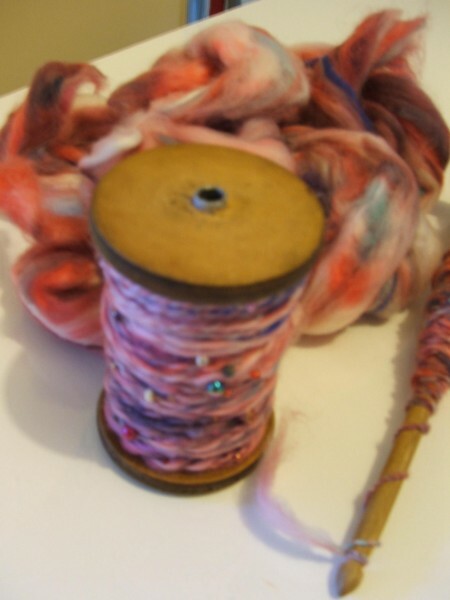 I have added new pages to my site, mainly about spinning and fibre preparation. I have also added a page of DIY spinners and wheels, including a fabulous cardboard charkha - check it out!. I have also been knitting, not something that comes naturally, and my Corriedale mountain is now a rather large piece of knitted fabric that vaguely resembles a man's jacket. The pattern i was working from and adapting included knitting the sleeves onto the body, rather than setting them in, which I thought was great as my DH has very long arms and this allows me to at least get the length right. This has been a huge learning curve, and I am now pretty good at frogging. I still have the sleeves to finish, a collar to do, then adjust the body length, and put in a zip. I might just get this finished before spring! One of the really off-putting things about a drum carder is cleaning it. I use mine for raw fleece; I never use it for already processed fibres, so it doesn't get the use it should do. When I got my carder, a very elderly Ertoel, it came with the original instructions which suggested using a piece of thin cloth over the drum to keep it clean and to make it easier to change colours, types of fibre etc. I tried, first with an old bit of sheeting, and secondly with a J-Cloth, and could not get either to to sit nicely around the drums. Thanks to another Aussie from a couple of forums I belong to, I had another go. This time I used a really cheap and nasty knock-off J-Cloth type of paper towel, and pushed it down hard with a nail brush, and voila! up-dating links on my web-site, and spindles. It takes a while to load, but is well worth it as the photos are excellent! As someone who has experimented with making a hackle, its an elegant alternative to spending a lot of money you may not have. which has instructions on making a wool comb. I have added these, and other links, to relevent pages on my site. I was recently the recipient of a lovely hand-made drop spindle with a clay whorl, and a hand carved shaft made of gum. The shaft is long enough to use as a support spindle for thigh rolling. This means a lot to me, as generally my spindles are home made from drinks coasters or toy wheels, and while they are very efficient, they are strictly utilitarian. This spindle was lovingly made, and the donor's daughters decorated it and helped choose the eucalyptus branch that made the shaft. I shall treasure it! I have added new spinning content to my web-site, including a method of finding the centre of a round object, such as a drinks coaster, to make a drop spindle. I have also added links to a couple of drop-spindling groups at the bottom of the spinning page, http://kero1au.tripod.com/id17.html , and to Barbara Herdmans new book on tri-loom weaving at Lulu: http://www.lulu.com/content/792110. I haven't had time to download and read it yet, but the tri-loom weaving community is very excited about it. Its been nearly 6 months since my last entry - I've been on summer mode and its only just started raining here in South Australia, at least that's my excuse! Not that I have been completely idle; my Corriedale fleece mountain is now a knitting yarn mountain and I have actually started knitting it! And on the basis that there is NO SUCH THING as too much fleece, just not enough cupboard space, I have been sorely tempted........... and happily succumbed! I also went book shopping and treated myself to Patricia Gibson-Roberts Spinning in the Old Way and the Interweave Handspindle Treasury. Despite the anger felt by many spinners on discovering that the Gibson-Roberts book was a reprint under another name, for those of us that haven't read the first one, its a revelation, and made me re-examine how I felt about drop spindles. I learnt to spin on a boat anchor and couldn't wait to transfer my fledgeling skills to a flyer wheel. A pretty, and much lighter top whorl spindle from a secret sis exchange re-introduced me to the drop spindle, and I spent the summer trying out different types of spindle, and learning the thigh roll. I also mutilated a couple of wooden drinks coasters from the thrift shop to see if I could make a lightweight spindle as light as the ones available in the States. I have one which spins like a demon, with the whorl at the very top of the 12 inch shaft, just below the hook: the other has a carved hook with the whorl a bit lower down a 9 inch shaft, and is in my humble opinion, pretty good, but not quite as fast. They both weigh in at just under 1 ounce/21 grams and have been well used as I experiment with different styles of yarn creation. I have no idea about the dynamics of drop spindles, and have been eagerly devouring articles I barely understand about the physics involved in turning a spindle on a lathe. I don't even own a lathe. I do understand that the shape of the whorl influences the speed it turns at, and the length of time it spins, though how do you come to determine the point at which you get the maximum of the first without sacrificing too much of the second? Which conundrum of course means I need a cup shaped top-whorl spindle to experiment with............... ! Regardless of the rights or wrongs of republishing a book from a popular and respected author under a different title, I gather from other Aussie blogs I have found that Spinning in the Old Way may well be generating a renaissance in spindling down-under and that has to be a good thing!